Ask any Australian about The Kimberley and they will get a wistful look in their eye as they are transported by the dream of visiting one of the nation’s most astonishing natural wonders! 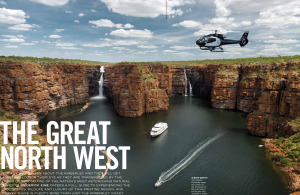 It’s no coincidence that Tourism Australia chose Western Australia’s vast Kimberley region to showcase the grandeur and spectacle of our magnificent landscapes in the 2008 blockbuster Australia. Unlike the Central Australian pair, Uluru and Kata Tjuta, where tourism has been active for over half a century, visitors to the Kimberley have only been arriving in appreciable numbers for barely half that period. 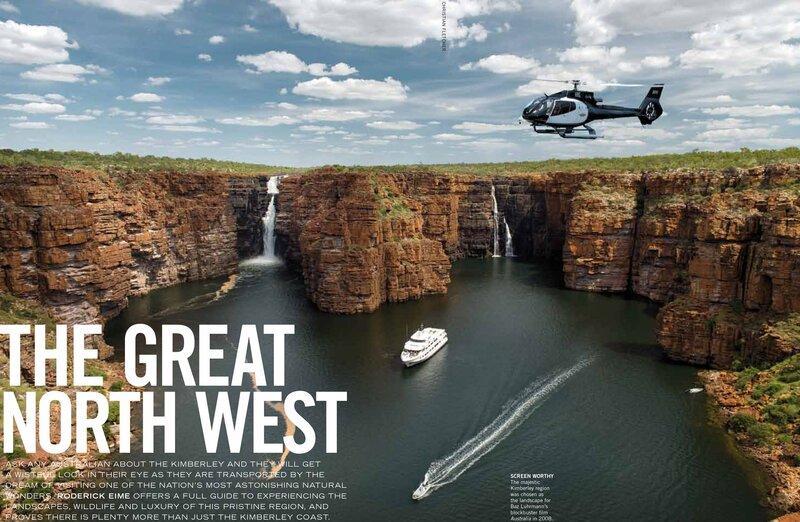 Perhaps as a result of near-impossible isolation, harsh climates and the almost complete lack of infrastructure, Australia’s North West remained off the tourism radar until adventure cruisers and remote fishing charter operators changed that. The gobsmacking panoramas of Mitchell Falls, Raft Point and mystical Montgomery Reef could not have been better suited to the big-budget cinematography of Baz Luhrmann’s movie. Love it or not, the golden-hued ancient landscapes of the Kimberley were presented spectacularly on screen. More recently, however, it’s been the furore over oil and gas exploration highlighting the region, with local tourism businesses fearful that unfettered development will tarnish the unspoilt quality of the iconic Kimberley. One of the most experienced adventure cruise operators in the region is North Star Cruises, launched by local fisherman and pearler, Craig Howson, back in 1987 with a few ad hoc fishing and diving charters for mates. Nowadays Howson operates the vessel many refer to as the benchmark for Kimberley adventure cruising. With just 18 luxury cabins and staterooms, the $12 million boutique vessel, True North, was built by the Fremantle yard, Austal, in 2004. Boutique cruise vessels like the 50-metre True North are perfect for exploring these uncharted waters where local knowledge means everything. Of course, exquisite cuisine, sumptuous cabins, doting crew and expert guides complete the picture. Now, with multiple national and state tourism awards under its belt, True North Adventure Cruises has expanded as far afield as Papua New Guinea, Sydney’s Hawkesbury and South Australia’s Gulf St Vincent.